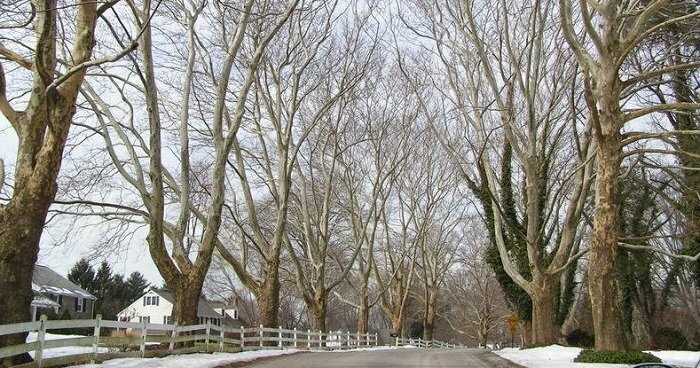 The white branches reach into the winter sky, making a stark contrast to the dark gray trunks of the other forest residents. .
Platanus occidentalis is the botanical name for the Eastern American Sycamore. It is one of the largest trees that grows east of the Mississippi River. Liriodendron tulipifera, the tuliptree may grow taller in some instances, but the sycamore generally has a larger trunk and will outweigh it in sheer mass. The large sheets of peeling bark give this tree an unmistakable appearance and they stand out along the riverbanks and lowlands of Eastern North America. 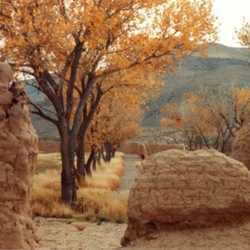 Native Americans valued the sycamore and many tribes had a multitude of uses for it. Many medicines were made from the bark and leaves and canoes were hollowed out from the long straight trunks. The Cherokee believed that fire first came to Earth as lightning striking a sycamore tree. From treatments for cuts and wounds, to infant rash the sycamore was used in many ways by the Native Americans. They even made a slightly sweet drink from its sap, although the sugar maple was more desirable for this purpose. The European settlers also had many uses for the sycamore tree. It grew quickly and had a good, strong wood. From chopping blocks, wagon wheels, crates and boxes, to paper pulp, the sycamore quickly became a multi-purpose tree. It was one of the first trees intentionally planted for commercial harvest. Another of the common names for Platanus occidentalis is buttonwood. The name is self-explanatory; it was a favorite wood for making buttons. This tree participated in the historical event founding the New York Stock Exchange. A group of twenty-four gentlemen gathered under a buttonwood tree at 68 Wall Street, on May 17th, 1792 and negotiated the terms of the brand new speculative market. The document that they all signed is known as the Buttonwood Agreement. Sycamore trees grow rapidly and are quite striking in the landscape. The appeal of quick shade tempts many home-owners. Care should be taken to make sure that a sycamore tree is a good choice for the site you have chosen though. The roots can heave concrete sidewalks and clog sewer drains. The leaves and seed balls are large and can create a mess in high traffic areas. To be an asset to the home-owner, these trees need a large yard or acreage to grow best. If such a site is available they will make an outstanding specimen planting and should be considered. Sycamores grow best in zones 4 through 9, with ample water and in well drained soil. It is originally a tree of the eastern American river bottoms and will attain the greatest height and size in similar conditions. The unique bark plates will shed off of the trunk as the tree grows. A mature specimen will resemble a piece of camouflage fabric with the upper branches almost totally white. 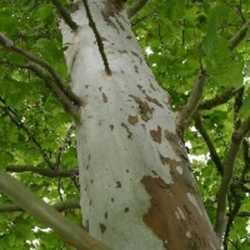 This is caused because unlike most trees, the bark of the sycamore does not have the ability to expand as it grows. There are a few pests that plague the sycamore tree but powdery mildew and anthracnose are the two main problems. A properly applied fungicide will usually take care of most troubles as this tree is pretty resilient. Deer are usually unwilling to browse on sycamores unless they are small saplings. When planted in a sunny area and given plenty of growing room, it can be a striking addition to your yard. They grow quickly, and can attain an impressive height in just a few years. Just make sure that this tree is suitable for the intended space. This is a versitile tree that tolerates many growing conditions and can succeed in soils that range from alkaline to acid. Soil make-up can be clay, sand or loam. Its moisture requirements range from well-drained, to flood-soaked. This makes it a tree that thrives in many situations. Sycamore trees have good tolerance for drought and can resist salt spray to a moderate extent. In other words, they will grow just about anywhere, in just about any environment. The leaves of the sycamore tree are quite large and resemble a maple leaf somewhat. They are more broad than long and have several notched lobes. The leaves are a pleasing light green in the summer and autumn turn a lovely gold. Male and female flowers are inconspicuous and bloom on the same tree each spring. The result is the unique seed ball that is made up of many seeds called achenes. Some birds use them for food but they are usually only eaten when the more desirable sources have been consumed. 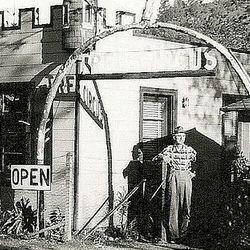 Sycamores are such a versatile tree with a great history. If you have the space to spare, one would make a great addition to your landscape.